Inflammation has been reported to play critical roles in the development of osteoarthritis. In the present study, we investigated whether mangiferin (MFN) had anti-inflammatory effects in IL-1β-stimulated human osteoarthritis chondrocytes. The cells were treated with various concentrations of MFN in the presence or absence of IL-1β. The production of MMP-1, MMP-3, PGE2, and NO was measured in this study. The expression of NF-kB and PPAR-γ was detected by western blot analysis. MFN inhibited IL-1β-induced inflammatory mediators PGE2 and NO production. MFN also inhibited IL-1β-induced MMP1 and MMP3 production. IL-1β-induced NF-kB activation was significantly inhibited by MFN. In addition, MFN was found to up-regulate the expression of PPAR-γ in human osteoarthritis chondrocytes. 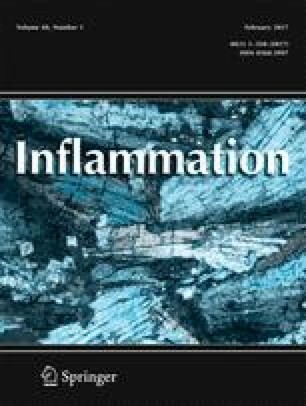 PPAR-γ inhibitor GW9662 significantly reversed the anti-inflammatory effects of MFN. These results suggest that MFN inhibits IL-1β-induced inflammatory response in human osteoarthritis chondrocytes by activating PPAR-γ. This research project was supported by the National Natural Science Foundation of China (30500508) and the Natural Science Foundation of Heilongjiang Provinces (D201112). The study was in accordance with the Declaration of Helsinki and Tokyo.